Beneath the placid waters of Lake Roosevelt at this location lies what was once one of the most important native sites on the Columbia plateau - Kettle Falls. For thousands of years, Indians from as far as the Great Plains would gather here each year to harvest some of the millions of salmon that ascended the Columbia River. In the summer months, when salmon fight the current of the Columbia for over 700 miles to their breeding grounds in the small tributaries of the river, they can been seen flying through the air, jumping rapids along their route. Indian tribes from miles around would travel to the falls to harvest enough salmon to last the entire year. 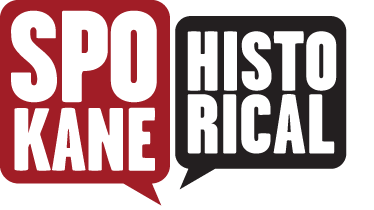 Around a thousand people would attend every year. 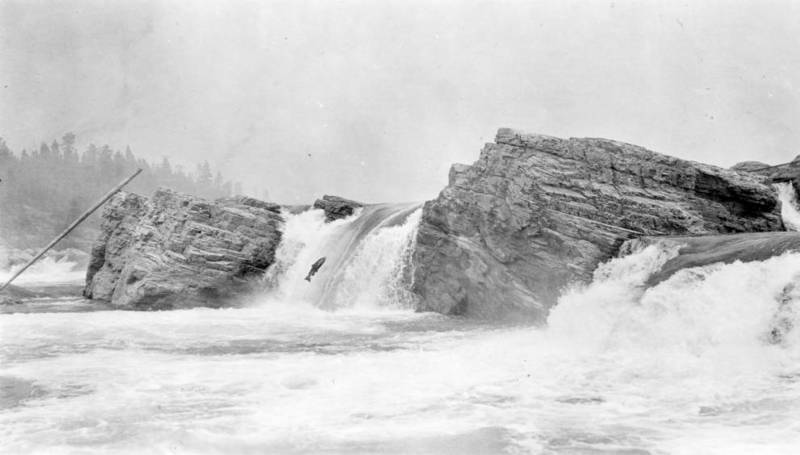 The falls were considered sacred ground, and tribes would fish side by side, even those who were at war with each other. 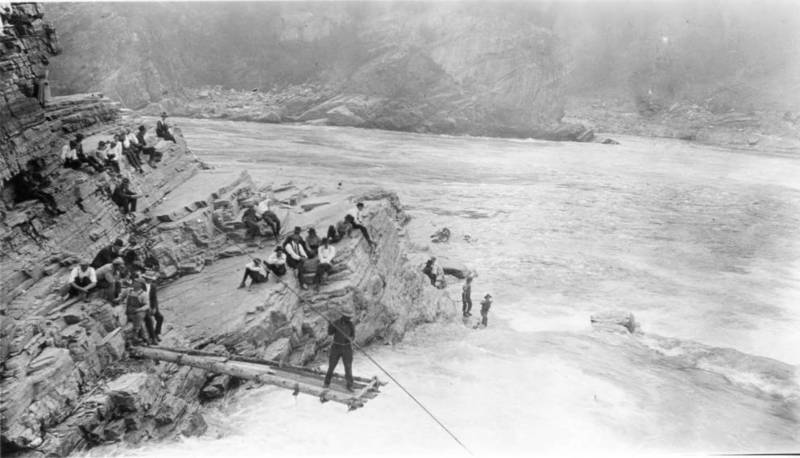 Standing on planks over the falls, particularly strong men would stab at fish in the water, or as they were jumping over the rocks with long poles. The moving target could bring even the strongest man plunging into the water, but with careful balance, Indians were able to bring in the 15-20 pound catch without a splash. J-shaped baskets made out of willow were also attached to rocks so the tall end of the basket blocked the salmon as they leaped over the rapids, and falling into the basin. At the end of every day, the Salmon Chief would divide the catch among the tribes. Other than catching fish, the tribes would socialize, share news, trade, and gamble. Family member and friends would reunite every year. Young men would have the opportunity to meet young women. But these traditions would end with the building of the Grand Coulee Dam. The last gathering, before the waters inundated the site, was in 1940. Known as the Ceremony of Tears, tribes celebrated and mourned a way of life that was ending after thousands of generations. Some people claim 3-5,000 people in attendance with 2-300 lodges on site others say it was closer to 8-10,000. Between 1969 and 1974, the water was drawn down for dam construction and the falls emerged for a few short weeks. Now only a few days a year, the reservoir is low enough for the tallest rocks to break the surface, providing a faint reminder of what lies beneath. Untitled: Fisherman at Kettle Falls with a recently caught salmon and fishing poles. Courtesy of Spokane Public Library Northwest Room. Untitled: The crowd watching the fisherman spear salmon from a plank over the falls. Courtesy of the Spokane Public Library Northwest Room. Untitled: Salmon jumping over the rocks at Kettle Falls. Courtesy of the Spokane Library Northwest Room. Untitled: Tourists viewing the fall in 1887. Courtesy of the Spokane Public Library Northwest Room. 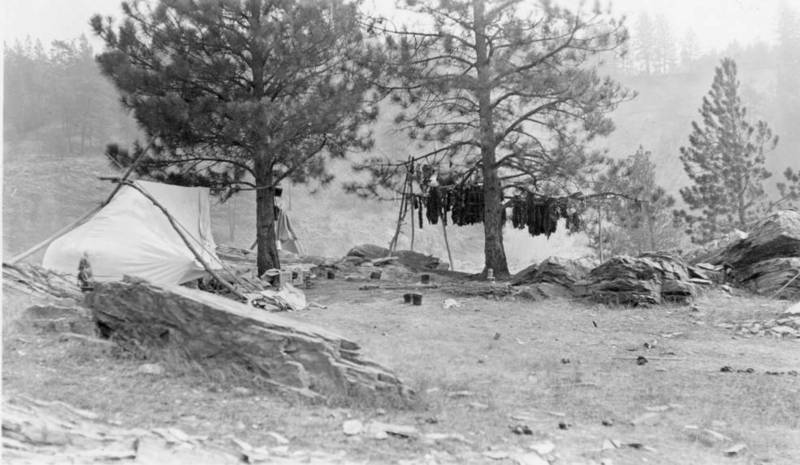 Untitled: Salmon Drying on tree branches at a camp during the salmon run. Courtesy of the Spokane Library Northwest Room. Untitled: Sightseeing at Kettle Falls. Courtesy of Spokane Public Library Northwest Room. 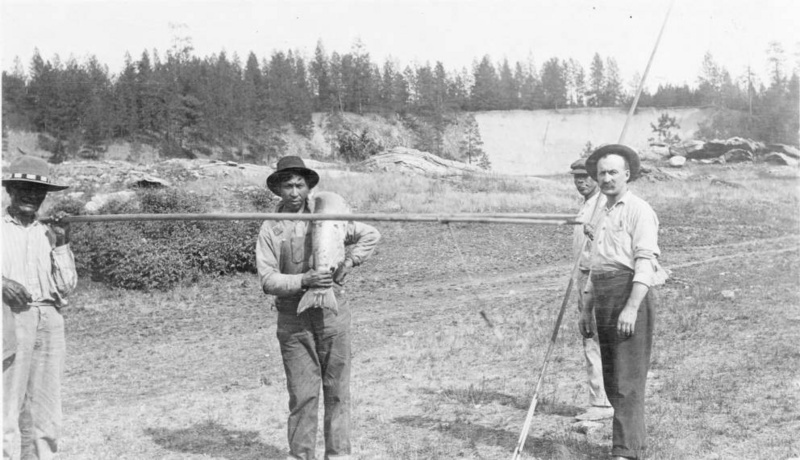 Erin Pulley, “The Fishery at Kettle Falls,” Spokane Historical, accessed April 20, 2019, https://spokanehistorical.org/items/show/433. "Hordes Spear Salmon," New York Times, (August 3, 1929). "Ancient Island Camp," Spokesman Review, (June 9, 1940). Chance, David. People of the Falls (Don's Printery, 1986). 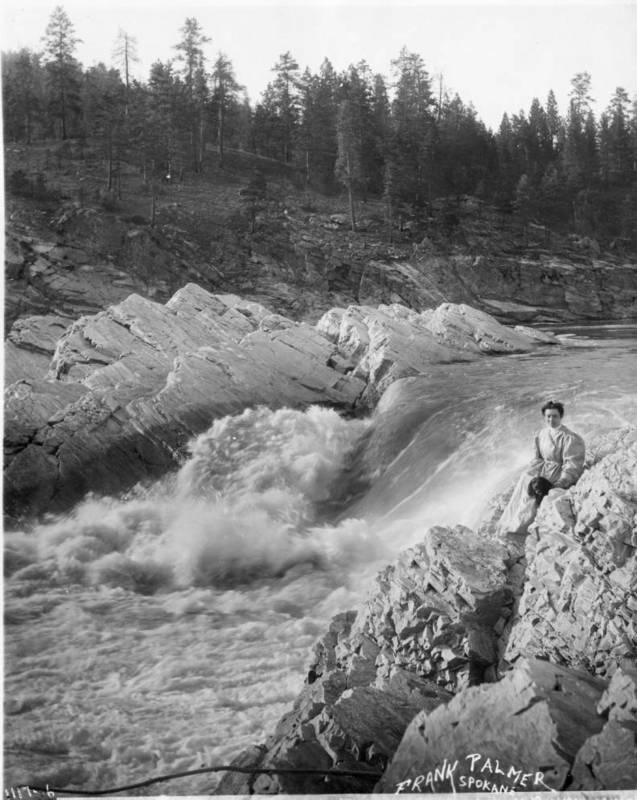 Kettle Falls Brochure, Coulee Dam National Recreation Area, U. S. Department of Interior, National Parks Service. Nullet, Lewis and Joan. 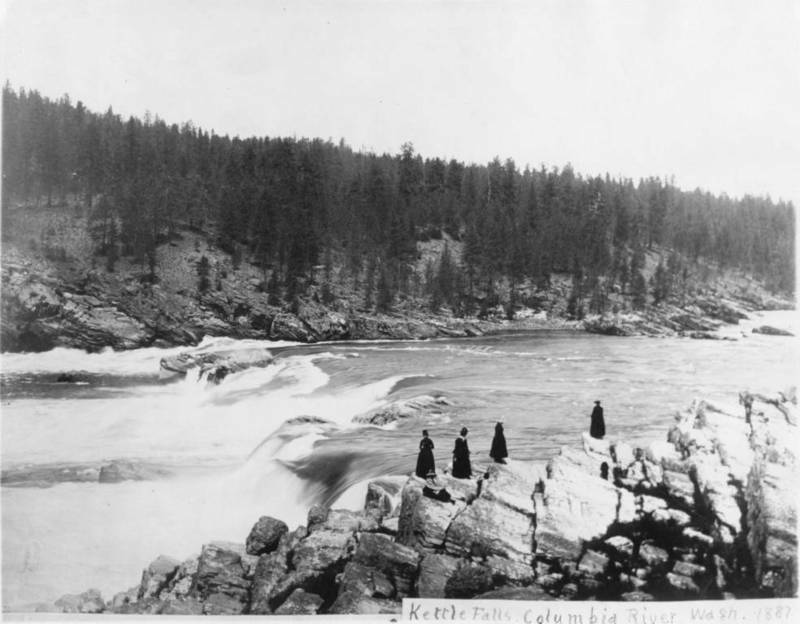 Brief History of Kettle Falls (S.I. 1992).